Since 1974 the species had been recorded from a number of sites in Dorset, at Arne, Horton Common, Keysworth Farm near Wareham, Parley Common, Ramsdown Common, Stephens Castle and Town Common. It has also been found at Cranes Moor in the New Forest and probably at two other sites in Hampshire, as well as at Chobham Common, Surrey (Askins & Jones 1998). Since 2000 it has started to appear widely in southern England, and as far north as Nottinghamshire. It is widespread in southern and central Europe. Dry lowland heathland, and other vegetated habitat such as gardens. E. aphana has been typically found on dry heathland in the building and mature phases, with some patches of bare stony ground and Ulex europaeus and Pinus sylvestris present. Recent records have been from a variety of dry habitats, including gardens and brownfield sites. Both sexes may be found as adults in early summer, although females may last longer, unlike E. tuberculata, which is a late summer and autumn species. 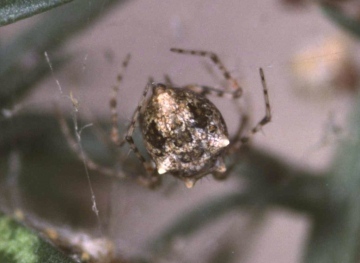 The spider was fairly frequent at most of its known sites, and now appears to be increasing rapidly, spreading to new habitats. Fire and loss of heathland to building development, agriculture and invasion by pines (Pinus sylvestris and P. pinaster) and other trees. Clearance of rhododendron and other invading vegetation on heathland, together with grazing, mowing or burning in such a way as to allow Calluna to reach the mature phase. Additional control of scrub and pine invasion by hand-pulling may also help. However, the spread of this species to new habitats including gardens and brownfield sites means it is unlikely to warrant specific management measures. Ero aphana egg sac with newly hatched spiderlings. Ero aphana showing metatarsal spines.